Francis Alÿs is a Belgian artist who has created a diverse body of artwork that explores urbanity, spatial justice, and land-based poetics. In 2004 Alÿs walked along the armistice border in Jerusalem, known as ‘the green line’, carrying a can filled with green paint. The bottom of the can was perforated with a small hole, so the paint dripped out as a continuous squiggly line on the ground as he walked. and sometimes doing something political can become poetic. 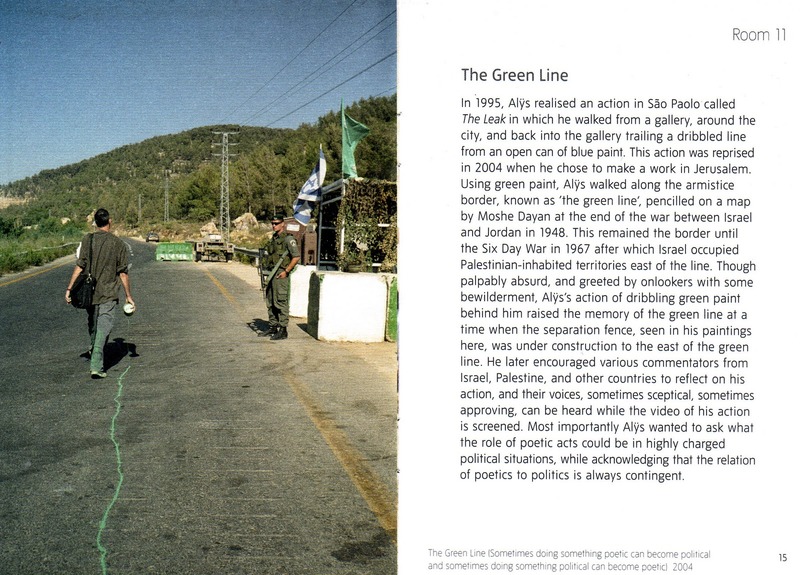 In this work the artist walks the Green Line through Jerusalem, a temporary cease-fire boundary created initially by the UN after the Arab-Israeli war of 1947–48 but redrawn by the Israeli authorities in 2004 as a more permanent barrier that incorporates gains made at the expense of Jordan after the Six Day war in 1967. Alÿs restricted his walking to a 15-mile stretch through a divided Jerusalem, a hike that took him down streets, through yards and parks, and over rocky abandoned terrain. In a film of the walk made with Julien Devaux, Philippe Bellaiche and Rachel Leah Jones, he seems to attract little notice. He takes no sides, he makes no political statements – he’s just walking, pointing out things without words. Shortly after this walk, a filmed documentation of the walk was presented to a number of people whom he invited to react spontaneously to the action and the circumstances within which it was performed. Video interviews from The Green Line include talks with Rima Hamami (Jerusalem – anthropologist), Albert Agazarian (Jerusalem – historian), Yael Dayan (Tel Aviv – member of Knesset), Jean Fisher (London – art historian), Ruben Aberjil (Jerusalem – activist), Amira Hass (Ramallah – journalist), Nazmi Jobeh (Jerusalem – architect), Eyal Sivan (Tel Aviv and Paris – filmmaker), Eyal Weizman (Tel Aviv and London – architect), Michel Warschawski (Jerusalem – activist). Watch it all, it is much more than just “artsy stuff”, Alÿs and his socio-political intervention bring attention to great issues that became so normal, so familiar, that we even forget that they are issues. Let us be reminded, let us act.